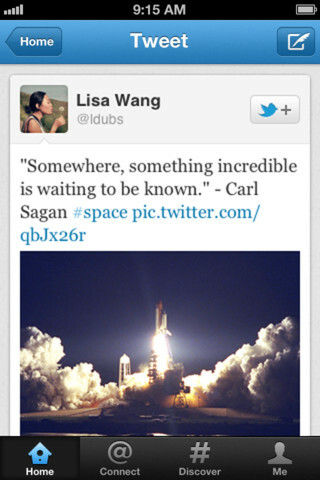 Improved Search Functionality- the updated Twitter app includes suggested spellings and related terms while typing. Moreover, when you search for people, the smart search feature will autocomplete searches for people you follow when you start typing in his or her first or last name or username. Specifically for iPhone users the updated app includes the ability to tap the search box in Discover and see your recent queries and even more- when searching for a username in Connect, the app gives you the ability to go directly to someone’s profile. Push Notifications-this new feature added to the app allows you to choose to be notified when someone new follows you on the service, or when your tweets have been retweeted or favorited by someone. So now you are able to customize your account the way you get rid of unnecessary alerts. Discover Tab: this feature has been shifted from Twitter on the web to its mobile app and similarly to its web-based counterpart, lets you know what tweets people you follow have favorited or retweeted. Moreover, the discover tab let you know if someone you follow has decided to follow a new person or add a new person to a list. The activity has been moved below the Discover Tab, and once you tap on a story you’re able to see more tweets about a trend or news story that can be replied to, retweeted, or favorited. Have you already downloaded the updated Twitter for iPhone? If yes, we’ll be glad to see how impressed you are below in the comments.